This is a fascinating exploration of the relationship between marriage, violence and sorcery in an Australian Aboriginal Community, drawing on David McKnight’s extensive research on Mornington Island. 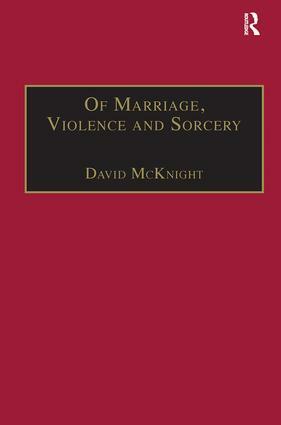 The case studies, which occurred both before and after a Presbyterian Mission was established on the island, allow McKnight to show how the complexities of kin ties and increased sexual competition help to explain incidences of violence and sorcery, without resorting to psychiatric justifications. He demonstrates that kin ties both stimulated conflict and helped to mitigate it. Following on from McKnight’s previous book, Going the Whiteman’s Way (Ashgate 2004), Of Marriage, Violence and Sorcery offers an archive of valuable primary materials, drawing on the author’s forty-year knowledge of the community on Mornington Island. Contents: Preface; History of the Wellesley Islands; Marriage: Lardil and Yangkaal: endogamy and exogamy; Kaiadilt endogamy and exogamy; Violence: Early time fights; Baya! Baya! Fight! Fight! ; Violence in the 1970s; Reasons for violence; Sorcery: Sorcerers and clever men; Spearing in the Bush; Recent sorcery cases; Some general observations about sorcery; All the Puripuri men are dead; Appendix: sorcery cases; Bibliography; Index. David McKnight held academic posts at the University of Edinburgh, the London School of Economics and the University of Western Ontario, before retiring on the Emeritus staff of the Department of Anthropology at the London School of Economics. He was well known for his work on kinship and marriage, beginning his research amongst Australian Aborigines in 1966, and living with the people of Mornington Island in Northern Queensland for over five years and the Wik people of Aurukun in Cape York Peninsula for a year in addition to making brief visits to other Australian Aboriginal communities.